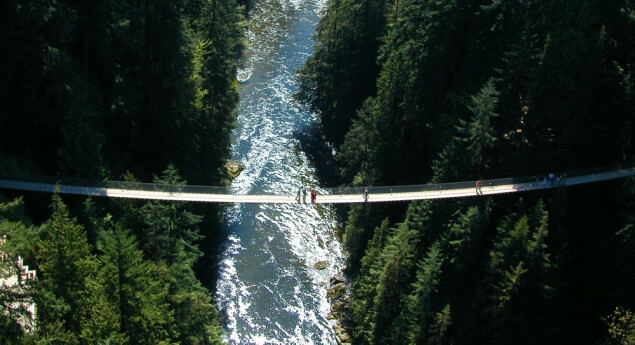 Capilano Suspension Bridge crosses to towering evergreens, cedar-scented rainforest air and Treetops Adventure, 7 suspended footbridges offering views 100 feet above the forest floor. The new Cliffwalk follows a granite precipice along Capilano River with a labyrinth-like series of narrow cantilevered bridges, stairs and platforms and only 16 anchor points in the cliff supporting the structure! Originally built in 1889, Capilano Suspension Bridge stretches 450 feet (137m) across and 230 feet (70m) above Capilano River. Since then much has been added to the twenty-seven acre park. CLIFFWALK is the park’s newest attraction – a cantilevered walkway clinging to the granite cliff high above Capilano Canyon. Treetops Adventure, seven suspension bridges through the evergreens taking you up to 100 feet (30m) above the forest floor, offers a unique squirrel’s eye perspective of the forest. Guided nature tours, the Kids’ Rainforest Explorer program and the Living Forest exhibit enhance this unique rainforest encounter. Enjoy seasonal musical entertainment and First Nations culture. Take photos at the Totem Park and with the Capilano Tramps. Top it off with a visit to the gift shop full of quality merchandise from all over Canada and great homemade fudge! 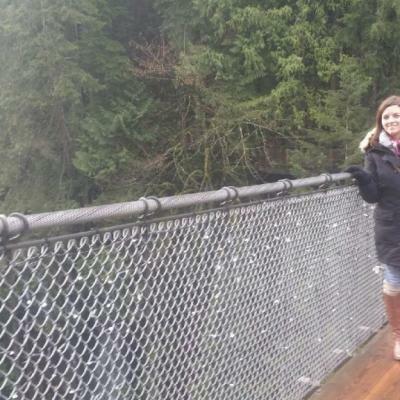 It’s all in a day’s fun at Capilano Suspension Bridge Park. I grew up going here a lot. The bridge is always very full, however the views of the canyon beneath are still stunning. Be careful not to drop your phone into the water bellow! Capilano comes from the name Kia'palano, which was the name of a Squamish Chief. I believe it is vital to recognize the fact that Capilano suspension bridge is on Squamish land. 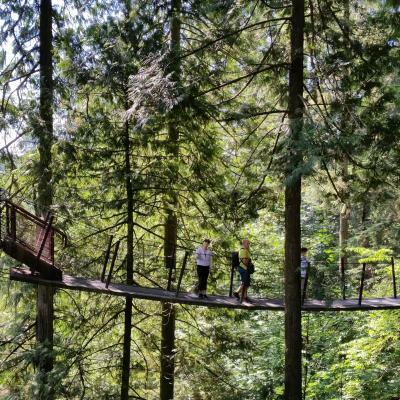 From the spectacular views to the information about local wildlife, Capilano Suspension Bridge Park is enjoyable for all ages. The Canyon Lights during the winter holidays are a must-see! I admire people who see the potential in something and act on it. 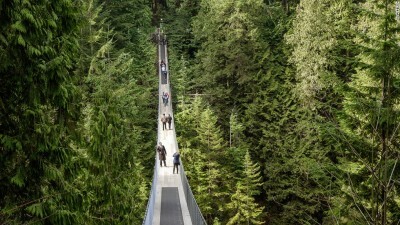 The building of the Capilano Suspension Bridge Park is an example of someone daring to do something that most people wouldn't have the vision to do. The Capilano Suspension Bridge is a simple suspension bridge crossing the Capilano River in the District of North Vancouver, British Columbia, Canada. The current bridge is 140 metres (460 ft) long and 70 metres (230 ft) above the river. It is part of a private facility, with an admission fee, and draws over 800,000 visitors a year. I went their with my boyfriend during the February reading break and we had a ton of fun. From the nature's walk to the cliff walk, to the trading post, it was full of adventures. We took part of the tours and learnt a lot about the history while we were there. The view was also amazing from the bridge as well as the individual trails. I would go back anyday! and I would recommend this to anyone who is looking for a day trip in that area! definitely worth it!! I enjoyed my time in the park and thought that the scenery was something to be rivaled. Walking through the trees will be something I will remember for life.